Approved by the FDA in 1989, spinal cord stimulation (SCS) has become a standard treatment for patients with chronic pain in their back and or limbs who have not found pain relief from other treatments. Many patients find that they can decrease or stop taking painkillers or other pain medications after undergoing spinal cord stimulation. Given these benefits, there has been ongoing investment and advances in spinal cord stimulation technology, and many individuals suffering from chronic pain find that neurostimulation positively impacts the quality of their lives. 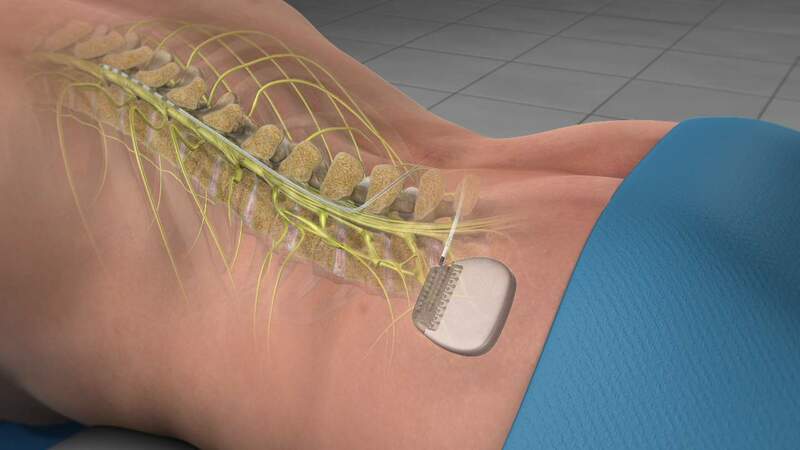 In spinal cord stimulation, soft, thin wires with electrical leads on their tips are placed through a needle in the back near to the spinal column. The leads are placed through a needle inserted in the back (no incision is required). A small incision is then made and a tiny, programmable generator is placed in the upper buttock or abdomen (under the skin) which emits electrical currents to the spinal column. Patient can stimulate electric stimulation with a remote controlled device according to his quality of pain relief. Failed back surgery syndrome: chronic pain after one or more back or neck surgeries to fails to alleviate persistent low back pain, leg pain ( sciatica or lumbar radiculopathy) or arm pain (cervical radiculopathy). It is important to note that the degree of pain relief experienced from spinal cord stimulation or peripheral nerve stimulation varies from person to person. As pain changes or improves, stimulation can be adjusted as necessary.